I love me a good cosy mystery! This story is set in a quaint little town of San Benedetto, California – known for its vinyards, paranormal history and murders. At least two of those things are connected! Maddie Kosloski runs the paranormal museum in town, which is surprisingly popular. 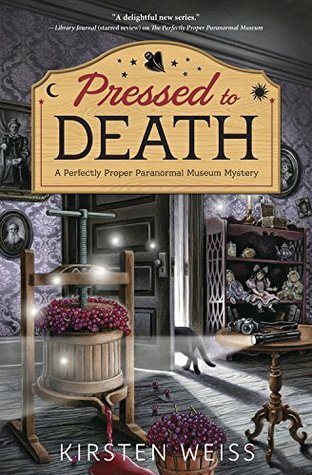 When she buys a haunted grape press from her supplier, it comes as a surprise when only a few days later, she’s finds herself accused of stealing it. Later that same day, her accuser is found dead at the bottom of a vat of grapes at the annual grape stomping display in the wine festival. True to her inquisitive nature and with the encouragement of the local Ladies Aid group and some of her friends, she sets about investigating the mystery of his death. Though this mystery was indeed pretty cosy, what with the belligerent cat, good friends who know when to bring pizza over, and a ladies only organisation which has started behaving like the mob – it was a little bit too easy to figure out, which left the last 40% of the book a little extraneous. I prefer plenty of red herrings to keep me guessing right until the end, as long as they’re explained away properly. The relationships between Maddie and her mother and boyfriend weren’t entirely satisfying, which made it a little difficult to bond with her fully during her escapades. The other aspect that confused me a little was the ambiguity about whether or not the paranormal exists or not, I’m more than happy to suspend my disbelief when it comes to the paranormal so feel free to lay it on thick! All that said, this was a sweet little murder mystery (if there can be such a thing?) which had just the right level of reality and quirk. There were several references to the first book in the series, which makes me wonder if Maddie would have been more relateable as a character if I’d read that book first… I guess there’s only one way to find out! So round up your slippers, put the kettle on and enjoy this little nugget of happiness.